How Does a Man Become a Cow in The Salesman and My Cousin Rachel? “How does a man become a cow?” a student asks in reference to a realistic story with one, odd, fanciful element being analyzed in class. “Gradually,” Emad, the teacher (Shahab Hosseini) responds in a prescient scene in the beautifully layered, rightfully Oscar-winning Iranian domestic melodrama, The Salesman. The better animal choice might be a pig…but the answer, crypto-Feminist writer-director Asghar Farhadi implies, is the same. No man is born a disgusting, sexist pig. You become one…gradually, based on the choices a misogynistic society forces you to make. When you live in a religiously repressed and politically oppressed society that systematically puts value on their women based on what their men do (or don’t do) to them, and in turn puts value on the men based on the value put upon their women, men will often too easily devolve into metaphorical pigs obsessed with shame, dishonor and possessions…even unwittingly sometimes. Take for instance Emad, the teacher who brings to his students eye-opening Western literature and moonlights (along with his loving, lovely wife, Rana, played by the powerfully emotive About Elly alum Taraneh Alidoosti) as an actor, currently putting on a production of Arthur Miller’s “Death of a Salesman” where he is Willy Loman and Rana is Linda Loman. The play, by the way, is being threatened with censorship by the government. I loved how this threat of censorship is presented as a throwaway line, a common, all-too-everyday annoyance in Iranian middle-class society (and don’t think this couldn’t happen here…or anywhere, with the right strongman in place). This couple seems like a liberal bastion in a repressive society, self-aware and quietly trying to bring about enlightenment through education and the arts. But the world they live in wants to turn women into objects and men into pigs. When an older woman Emad shares a taxi with refuses to sit next to him (out of fear that he might be a pig), the teacher is sympathetic and explains the behavior as a result of some man in the past having done something horrible to her which now makes her view all men as pigs. Yet even Emad, the enlightened teacher, a seeming cultural elite, can’t escape the slippery slope society places him and his wife Rana upon. When their apartment building begins to sink into the ground due to new construction next door (the new-found cracks in their walls symbolic of the cracks in their relationship that have been hidden just beneath the surface all along), they are forced to take an un-vetted apartment (that belongs to a theater friend) lest they become homeless. The previous tenant (a single mother and alleged woman of ill repute – who never gets to defend herself against all the rumors that fly freely about her) left behind her personal belongings and can’t pick them up until she finds a new home. It’s fascinating to see the beautifully intricate tiles and ornate wood work (look at those doors in the sinking apartment!) in these once grand, now decaying buildings…a symptom of a societal rot, as Iran, much like the married couple at the center of Farhadi’s drama, was not so long ago the liberal bastion of the Middle East before religious repression and political turmoil set in. One night, thinking that Emad has returned with groceries, Rana, while preparing for a shower, unwittingly buzzes up another man who proceeds to attack her. They decide not to involve the police because Rana wants to avoid the humiliation of having to tell strange men what happened to her (and wanting to hide from her husband how far the attack may have actually gone, because then that would bring shame upon him as well, having a wife who is now damaged goods)…and also, the perpetrator left behind his pick-up truck. Apparently in Iran, the police can’t be trusted to do their job, and to avoid any shame of victimhood, it’s easier to try to take care of things yourself. So Emad plays detective and uncovers the truck belongs to a working class delivery man…and ultimately deduces it was that man’s future father-in-law, a seemingly meek worn-out old man with a bad-ticker, who attacked Rana. The old man was a former client of the woman who in lived in their apartment before them and unwittingly thought it was she who was in the shower and not Rana. Emad becomes obsessed with getting revenge on the old man (even as Rana pleads for him to find them a safe new home and simply move on)…going so far as to design a plan to have the old man confess and be humiliated in front of his family. And when you meet his family (a sickly, hysterical, devoted wife and a doting daughter about to be betrothed to a hard-working pre-pig young man), it’s clear, this lecherous old man wasn’t always this way…his family loves him…he was kind and gentle once…he only became a pig…gradually…and his innocent family has no idea about his metamorphosis. And it’s here, too, where against all better judgement they thought they had, that Rana tragically realizes her own husband…in his own way…now fueled by his own feelings of shame and helplessness that he has turned outward into desire for revenge and the shaming of others…has become a pig too. The “salesman” she once loved, is symbolically dead. And I ask you, is there a filmmaker more adept than Farhadi at showing the insidious psychological and emotional rot that infests a religiously repressed and politically oppressed society? Meanwhile, the viewer, much like Emad, might obsesses over this old man (whose bad-ticker and stress over humiliation leads him to collapse…and we are to presume, die)…how far did the attack on Rana go…did he or didn’t he? 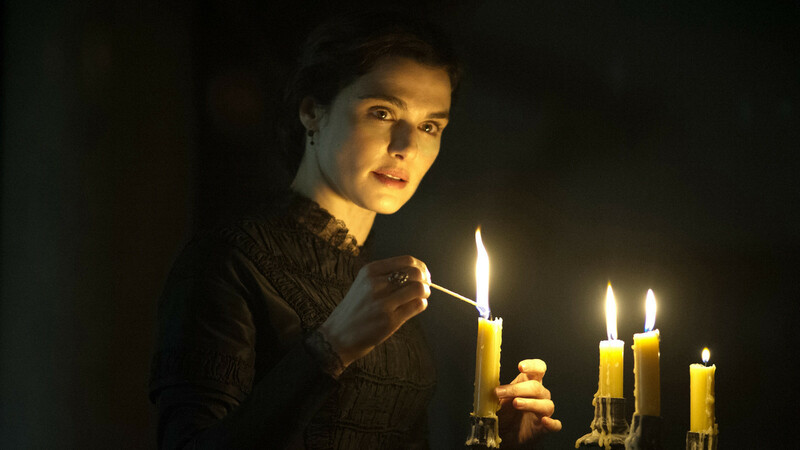 The period-piece picture perfect gothic British melodrama, My Cousin Rachel, a Roger Michell film based on the Daphne Du Maurier classic, surprisingly asks many of the same questions as The Salesman. In fact, it opens with the voice-over of a man obsessed asking over and over again…did she or didn’t she? Here, a young heir to his older cousin’s fortune questions that old man’s decision to marry another cousin…Rachel…whose past is infested with rumors and innuendos. Of course, that old man, soon then dies, his will still unchanged (despite the marriage) and everything left to the young man. As brilliantly portrayed by Rachel Weisz, Rachel is mysterious and charming and demure, but with hidden pain and rage bubbling underneath (forced to make her way in life the only way society then allowed…through a successful marriage to a man of means) and is now upon her younger cousin’s doorstep, a grieving widow with nowhere to live. The young man, fueled by rumors and his own shoddy detective work, can’t help but wonder if Rachel not only entrapped the elder cousin…but maybe even poisoned him! In 19th century England, another religiously repressed society not as far removed from modern-day Iran as you might think, we again see men obsessing over and defining themselves by the value they assign to the women in their family. Just as Emad’s obsession over what happened to his wife Rana (and by whom) leads him to inadvertently cause another man’s death and that man’s family to suffer in The Salesman, the young heir’s obsession with what his cousin Rachel did or did not do leads him to cause her untimely accidental death (even as he, himself, was succumbing to her charms…which may have been pure…or full of deceit…we will never know). Women, objectified…obsessed about…subjects of gossip and sources of dishonor…watching Farhadi’s pointed modern-day social commentary butted up against the handsomely aesthetic and period piece pleasures of a British melodrama like My Cousin Rachel…makes you realize that sadly not much has changed. And men, who perpetuate this objectification, become pigs gradually (both wittingly and unwittingly)…over and over again. It’s cold comfort to think that in Farhadi’s modernism, the women (grief-stricken and riddled with post-traumatic stress) at the very least survive to see another day…after all, like Rachel, they could’ve been sent careening over a cliff to their deaths. Maybe Iran is that liberal bastion after all. This entry was posted in Art, Art-house Cinema, Book to Film Adaptations, Movie Reviews, Movies, Politics, Psychology and tagged 19th Century England, Arthur Miller, Arthur Millers, Asghar Farhadi, British Gothic, Cows, Crypto-Feminism, Daphne Du Maurier, Death of a Salesman, Domestic Melodrama, Foreign Films, Iran, Iranian Films, Melodrama, Metamorphosis, Metaphors, Misogyny, My Cousin Rachel, Period Piece, Pigs, Plays, Rachel Weisz, Repression, Roger Michell, Rumors, Sexism, Shahab Hosseini, Shame, Symbolism, Taraneh Alidoosti, The Salesman. Appreciate your POV on The Salesman, David. I have similar thoughts, and then some other ones. I wrote that earlier this year, published on AAPress in Feb. As to the other film, I hesitated when it was showing and now reading your review want to go see it but find it’s no longer screening anymore. Hopefully in a second run theatre. Arti – you were right to tap into the timeliness of The Salesman. I loved how the film was so rich with detail and character and themes…it’s interesting to read what stuck to others vs. what stuck to me…so many layers to explore.